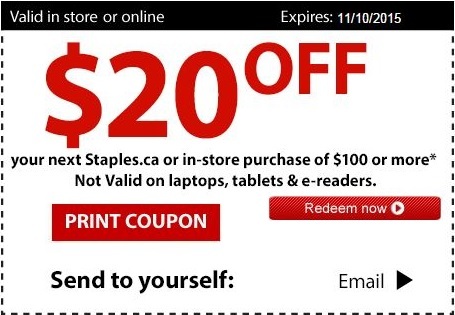 Use printable coupon at Canadian Staples stores and save money. Take $20 off your purchase of $100 or more. Offer is also available online on the official website. You can download your printable coupon here. Official source of the information is Staples Canada. Offer is time limited. More details about the promotion available at Canadian Staples stores or online.